Syntagma Square is located in the center of Athens and where you can catch the metro lines 2 and 3 to explore the city. It's also where the Greek Parliament, home of the famous changing of the guards, is located. It's a real spectacle, with Greek soldiers in original uniforms marching in almost slow motion across the square. It only takes 20 minutes and is really worth seeing up close. Just like the guards in London, these ones don't even blink at the hordes of tourists scrambling to get a photo with them. The night at the square is amazing. You can see the change each hour. Be punctual. 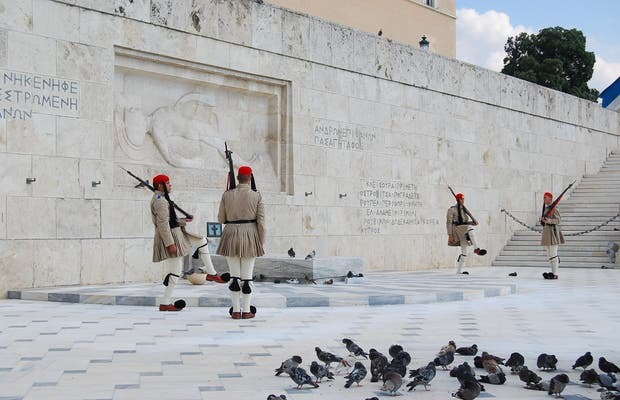 I went to Syntagma Square and I saw the change of the guards.. They were dressed strangely, they walked a lot.. It was quite interesting.